Admittedly, even after 3 other babies, these stress management activities for new moms have been a lifesaver for me this year. Being a new mom comes with its own stress different set of stresses. For some moms, this is your first time, which means you’ve never taken care of a baby 24/7. For others, it’s your second, third or in my case fourth baby. Daily tasks can just seem daunting at first, and I totally know what it’s like to be stressed out as a new mom, so I wanted to share some ways in which you can deal with it. I know what you’re thinking, I just got out of the hospital and brought a baby home. However, once your doctor clears you, you can start exercising right away. Your body needs that movement to help you get rid of stress. It will also help to boost your self-esteem as you see the baby weight begin to drop. This is a win-win. Even small things like taking the stroller out for a walk around the block once a day can be a huge mood booster and one of the best stress management activities that new moms need. Instead of snacking on sugar, which will only make your blood sugar rise and eventually make you crash, dive into some veggies. Good food is always the thing to dive into whenever you’re stressed. Plus, you won’t have the guilt of eating bad things, like you would if you ate chocolate cake. Keeping carrots, celery, cucumbers, tomatoes and even broccoli or cauliflower on hand ready to snack is great. Our healthy homemade ranch keeps it tasty while still being a low-calorie snack to boost your mood and immune system. If you’re stressed out, then consider taking a nap. I know it’s always easier said than done. To the mamas with one baby at one, if he/she sleeps, please sleep when they do. Being well rested in such a great feeling. Your body can also deal with stress better whenever you are well rested. For those juggling multiple kids at home with a new baby, seek out someone who is willing to come and sit with your kids for an hour so you can rest. You may not want to ask for the help, but your body and mind will thank you later. I’ve seen this floating around lately and I think it really works. Instead of scrolling through your phone or watching drama on television that stressed you out, consider getting an adult coloring book. Remember how awesome it was as a kid? It’s still that awesome as an adult. There is truly something soothing about coloring in geometric patterns or other random coloring pages. 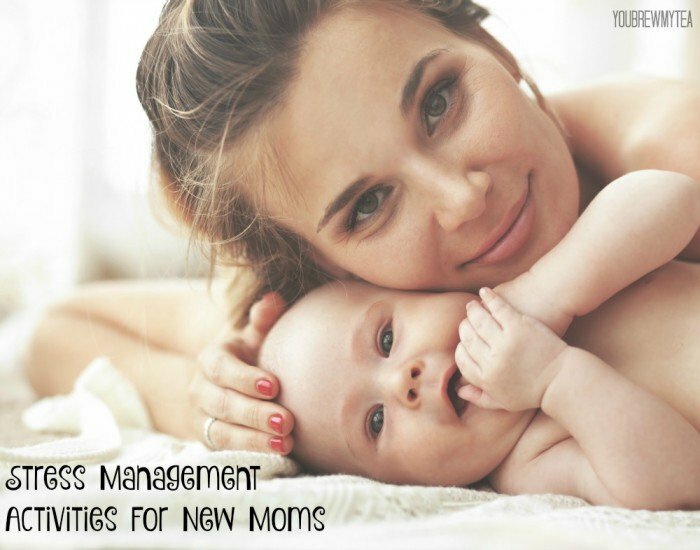 No matter how stressed out you are, there are ways you can combat it as a new mother. If nothing else works, put baby in a safe place and walk away for 10-15 minutes. The baby won’t get hurt from you walking away and de-stressing. New babies can be stressful and I hope these tips help you to learn how to de-stress! Check out some of our other helpful parenting tips below!